Many facial lines and wrinkles are linked to the muscles beneath the skin rather than the skin itself.Facial muscles are used to make facial expressions when you smile, laugh or frown which contract the muscles on your face. Over time, the facial muscles grow accustomed to certain facial expression and positions due to the repetitive muscle contractions which leads to a permanent lines or wrinkles, even when the face is relaxed. These lines can make you look angry, tired or older. Anti-wrinkle injection targets facial muscles, making those pesky wrinkles disappear and dramatically softening furrows and lines by producing a more relaxed look without surgery. This allows your skin to even out and become more youthful, smoother in appearance, long -lasting rejuvenation and natural-looking. Botulinum toxin most commonly injected to relax frown lines, crow’s feet and forehead lines, soften neck lines, elevate the corners of the mouth, chronic migraine and reduce excessive sweating. 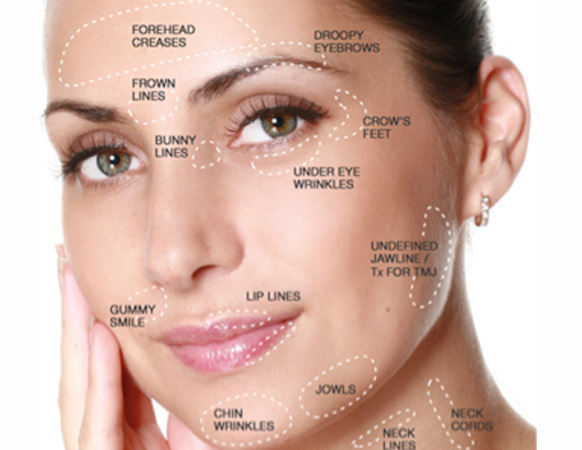 The effect of botulinum toxin usually lasts between 4 to 6 months, after which new applications are required. After several treatments, the effects of botulinum toxin can begin to be longer, and can last up to eight months. Some anti-wrinkles applications are listed below in the picture, for more information contacts us for a detailed consultation tailored to your individual needs. Smoothing deep wrinkles across your forehead. Softening frown lines and glabellar wrinkles between the brows. Relaxing the creases of crow’s feet. Smoothing out “smoker lines” around the mouth. Relaxing drooping cords in the neck (turkey neck). Stop the effect of hyper-perspirants. Anti-wrinkles are not addictive at all. However, some patients love their youthful look so much they want injections often to maintain their youthful appearance. If injections are not kept up, the face may reverse back to original state prior to the procedure. How long does it take for an anti-wrinkle injection to kick in? It takes 3-14days to completely work and a review is necessary to monitor your progress. How much anti-wrinkles do I need to see results? Every patient is different and has distinctive goals. The depth of your wrinkles and indentations will determine how many treatments will be needed to correct and lift your wrinkles. Our practitioners are highly trained and specialise in cosmetic injections for your individual needs and offer bespoke treatments. Botulinum toxin injection treatment is usually performed during a routine office visit that only takes less than 30 minutes, which is why it is often called a “lunchtime procedure.” Generally, no anesthesia is used for his injection as it is a virtually painless procedure. What to Expect After Botulinum Toxin injections: There is no downtime associated with anti-wrinkle injections, and you can return to work and other normal daily activities immediately. However, strenuous activity should be avoided for the remainder of the day after treatment. Avoid lying down for the four – five hours following treatment, and avoid touching the injection areas after the treatment. There might be some redness and swelling in the treatment area for the first day or two. Some slight bruising may also occur, but will dissipate in less than a week.